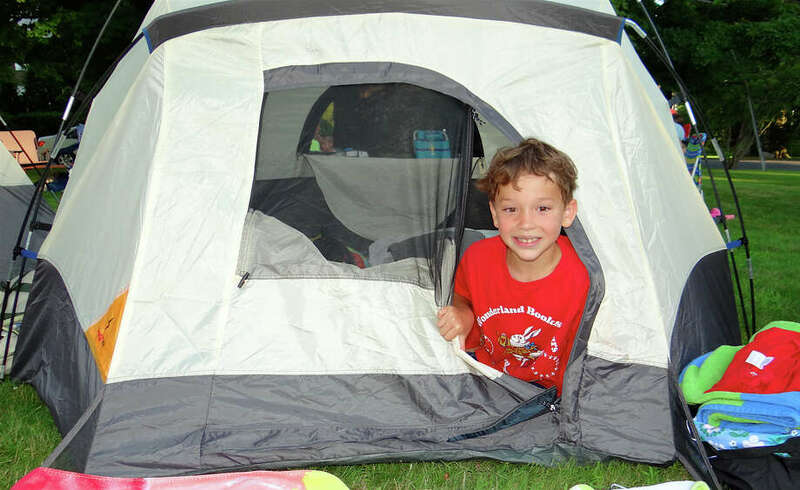 Reid Barry, 7, of Southport, pops out of his tent at Pequot Library's povernight potluck supper and campout Friday evening. It may not be mid-summer yet, but anyone dreaming of a magical night of seasonal fun would easily have found it Friday at the Pequot Library. Clear, warm skies embraced the library's 8th annual community potluck supper and campout as food, games, music and friendship were shared during a starry night on Great Lawn of the Southport landmark. The bountiful potluck dinner was arranged along several tables as the crowd enjoyed folk and rock music performed by the Merwin Mountain Band. S'mores were prepared over a bonfire, while youngsters played games and listened to ghost stories. And more than 20 families decided to keep the spirit going camped overnight on the library lawn. The event also served as a launch for the Pequot Library's Summer Reading program for children. For details, check: www.pequotlibrary.org.